At SUNCOM Knowledge Management is looked more from the holistic point of view without an overdependence of technology. The Best Practice Knowledge management encompasses the three constituents of Information. 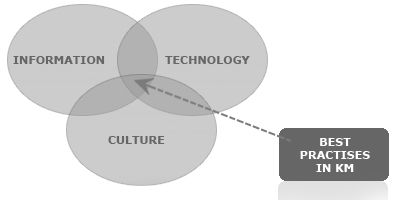 Technology and Culture and our framework encapsulates all these variables intermingling in appropriate proportions. Knowledge Creation, transmission and use remains unstructured to a large extent. Knowledge hoarding by the staff is common and the organizations find it difficult to have a framework in capturing the knowledge capacity among staff. SUNCOM has developed a rich repertoire of best Practices and has considerable experience in helping partners in deriving and identifying the missing links to a networked institutional climate. The Digital Knowledge Library (an enhanced version of a Document Management System) is an outcome of our experience in capturing isolated of unidentified “Knowledge Silos” into a Robust and intelligent repository. At SUNCOM, Knowledge Management (KM) comprises a range of strategies and practices used in an organization to identify, create, represent, distribute, and enable adoption of insights and experiences.